Three elegant 100 year old Victorian Oueen Anne's and a Coach House surrounded by flower filled gardens, brick patios, decks fountains and an outdoor Jacuzzi house the "Cheshire Cat Inn." Wedgewood wild strawberry china, English antiques, Chinese rugs and Laura Ashley furnishings all add to the sophisticated ambience. Enjoy breakfast on the patio or in the privacy of your own room. The daily afternoon wine hour includes brie, hors d'oeuvres, crudities and local wine. 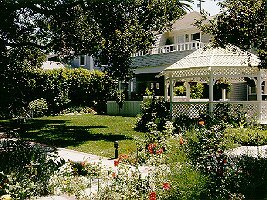 The Inn is located only four blocks from downtown Santa Barbara and is within easy walking distance of many fine restaurants and shops. The Inn has 21 guest rooms and suites, some with Jacuzzi tubs, fireplaces and balconies and the rates are from $150 -$375. 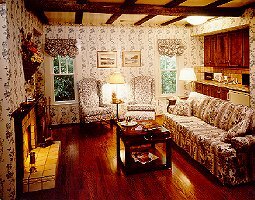 Three new cottages have been added, with kitchens, living rooms with private decks and hot tubs. Spa facilities are available at the Inn. This and other Santa Barbara Bed and Breakfast Inns can be found here in The Register.